These great seeds from Dinner Garden arrived in my mailbox this past week! Sign up to the Tomatoheirloom’s newsletter get your free basil seeds. Variety package includes 3 garden size packets: 1 each of Classic Genovese, Dark Purple Opal, and Lemon Basil. ($7.50 value) You do have to send in a SASE (self addressed stamped envelope) to get these 3 varieties of seeds. And if you haven’t requested your free seeds from Dinner Garden, you won’t be disappointed!!! 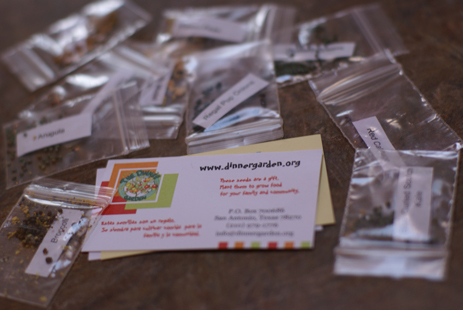 If you have a distribution center nearby for your Dinner Garden seeds, please stop by to pick up your free seeds. And if you can, please make a donation so they can keep sending seeds to those who need them free! Thanks to Free Stuff 4 Free for the heads up! Thank you…love getting free seeds to plant my first garden this year. I also signed up to receive the Gardens Alive free catalog and they sent a coupon to get $25 worth of products/seeds free. Gets me even more in the mood for Spring to hurry up. Even though everytime I try growing basil or dill it gets eaten by caterpillars. Thank you so much for this post! I’ve been tossing around starting a garden (in spite of my black thumb) and had finally decided to take the plunge this year – your post couldn’t have been more timely!! I requested seeds and made a donation! What a wonderful organization! Thanks for telling people about our program! The Dinner Garden is a small non profit that is funded entirely by donations. Please encourage your readers to make a donation, if they can, so that we can send seeds to people in need and help end hunger. Each seed packs costs us $1.79 to ship. If there is a distribution site close to your house, please stop by there to pick up seeds! Thanks for noting the distribution site! There was not one near me, so I requested by mail. I will update the post! Thanks so much for this post, I am in need of seeds! I kept track of your garden progress last year while I took care of my regular yard garden. Well this year we live in a bigger house with a smaller yard, so we are doing a square foot garden, I can’t wait. I will be referring to your blog a lot! I just did a post on my square foot garden. I have been reading about yours and was wondering if you had issues with bugs. If so, is there a recommended way to keep them away? I have heard about certain flowers you can plant or planting certain things by each other help. Any tips? Last year I sprayed a water-dishsoap solution on plants that had bug marks on the leaves. Seemed to work well! Thanks for posting these freebies! Yes! Please make a donation if you can! Not sure if it’s nationwide but Home Depot is having a sale this weekend Buy one get one free on all their seed packets! Wonderful post. I appreciate your attention to this subject and I learned a good deal. Well done!